Recently I got jungle fever with my nails. And come to find out, the very same manicure was apparently on Lauren Conrad’s blog recently too! Now I got this inspiration from the Sally Hansen nail decals, not from LC. But her manicure looked pretty sweet too, obvi. Nothing that girl does ever looks less than amazing. Here is my fierce manicure. So let’s walk through this shall we? I opted for a light pink for a base color. Fiji by Essie is my absolute favorite color in all the world. As soon as the temperature hit 60 degrees I whipped this bad boy out. It was between Fiji or Sew Psyched but I am so over the fall colors. A solid color to use as your base. I used Fiji by Essie. 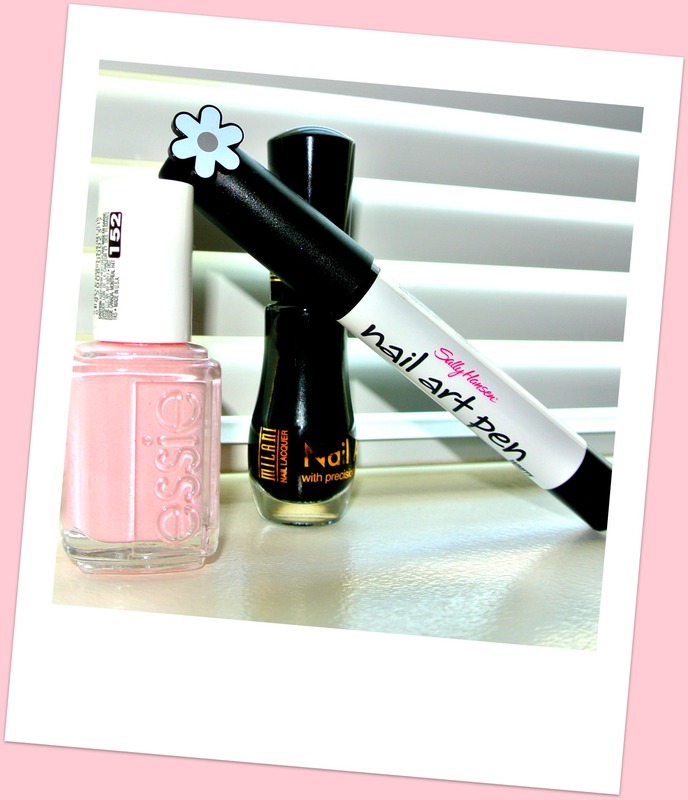 Nail art pens/polishes in black and white. I used Sally Hansen nail art pen in white and Milani nail art polish in black. Step one: Paint your nails with your base color, in this case, Fiji. Step two: Let nails dry completely. Step three: Apply a second coat of your base color. Step four: Let nails dry completely. Step five: With the black nail art pen/polish make little black leopard spots. Leave some of the spots open as if you’re making little curved less than and greater than signs, and close the others to make little black dots basically. * in this case less is definitely more. The first picture is of my left hand. I got a little carried away with the spots. On my right hand (which you’ll see next) I didn’t do as many spots and I am definitely liking my right hand more. Step six: Let the black leopard spots dry completely. *Completely, this is very important as they will smudge in the next step if you don’t! Step seven: With the white nail art pen fill in some of the open semi-circles, leave some of the other ones open and empty. Draw around the closed in circles to make it almost look like a halo. Step eight: Let your nails dry completely and cover them with a top coat. Next PostNext Super Bowl Manicure: NY Giants Inspired!